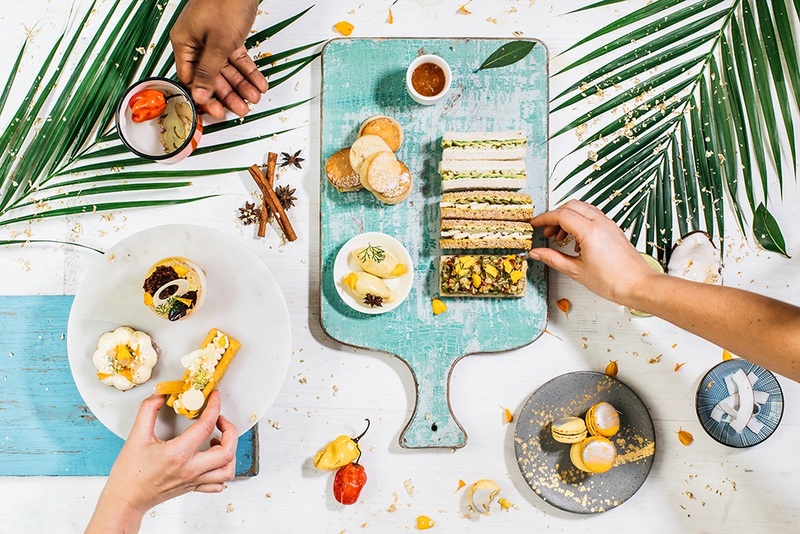 A Twist On A Classic - Caribbean Afternoon Tea. Happy Thursday. We had a mini heatwave here in the UK yesterday. I spent all afternoon in the garden yesterday, getting the grass cut and table and chairs out of storage. All ready for eating outside in the garden. New research revealed today has found that Caribbean cooking is the least tried cuisine in the UK, with only 27% of Brits having tasted Jamaican food and only a handful having tried dishes from other islands including Dominica (3%), Barbados (2.5%) and St Lucia (2%). 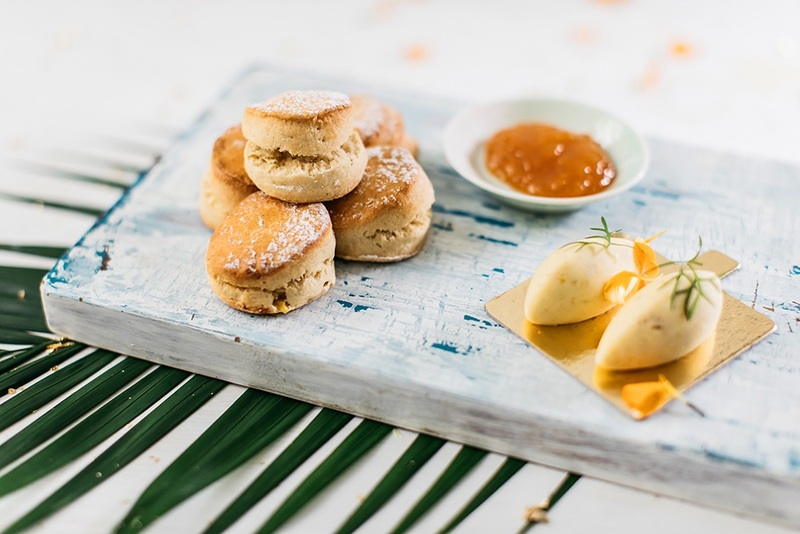 Celebrity Cruises, who commissioned the survey, has partnered with 2-Michelin starred chef and Masterchef: The Professionals quarter-finalist Jason Howard to encourage the nation to try this untapped food scene with a Caribbean twist on a British classic – the Afternoon Tea. 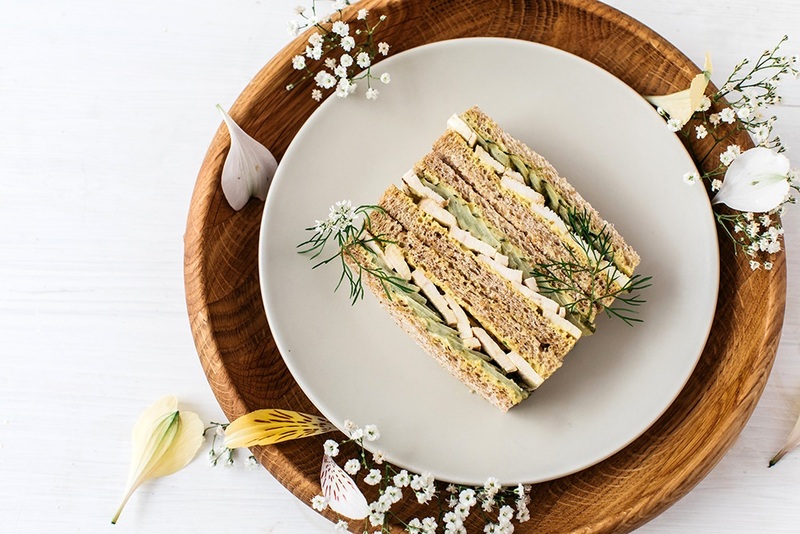 Before the afternoon tea comes to ships, Celebrity Cruises has released four recipes from the menu to encourage people to try the dishes at home. 1. Preheat the oven to 180C. Line a baking tray with baking paper. 2. Rub the butter into the flour, until the mixture looks like breadcrumbs. Mix in the sugar and salt and baking powder. 3. Place your mix in a mixer (or a bowl if you want to do it by hand) and add your milk and dried (or fresh) pineapple. 4. Stir until the mixture is even and the dough comes together, then let it rest for 30 mins to an hour. 5. Turn out onto a floured surface and roll to 1 inch thick, then cut out with cutters of your choice. 6. Transfer to a baking tray and brush with milk and bake for 15 minutes until golden and cooked through. 1. Blend all your ingredients together (the day before for the best result). 2. Rub jerk seasoning over chicken and place in your oven at 200C for 40 mins. 3. When finished take out and let cool in the fridge. 4. Once cool, slice thinly. 1. Take your raisins and pulse them in your food processor until fine. 2. Take your onions, raisin mix, curry powder and butter and place in a pan and let simmer on a low-med heat and mix with your spoon for about 5 mins then let cool. 3. Then add the mayonnaise and mix all together. 4. Place in your fridge until ready to use. 1. Using the bread of your choosing, take two slices and butter both with your mayonnaise mixture. 3. Add thinly sliced cucumber on top. 4. Layer the second piece of bread on top and slice into crustless finger sandwiches. 1. Put your gelatine leaves in cold water to sit while you get your soursop mix ready. 2. Take the soursop juice and heat on a medium heat until it reduces by half. 3. Add the condensed milk and lemon zest, then remove from heat as soon as it starts to simmer and set aside. 4. Then take your gelatine and squeeze all the water out, add to your mix and whisk until it dissolves. 5. Take a tray and place cling film flat along the bottom of the tray. 6. Pour your mix in and place in the fridge to set for 30min to an 1 hr. 7. Cut into small cubes for use when ready. 1. In a bowl, mix together the cream cheese, 100g of your sugar, lemon zest and vanilla extract until combined. 2. Then add heavy cream and whisk for two more minutes until combined. 3. Cool the cheesecake mix in the refrigerator for at least an hour before serving. 4. For the base, take the digestives and pulse them in a food processor until they look like bread crumbs. 5. Then add the melted butter and the mixed spice and combine. 6. 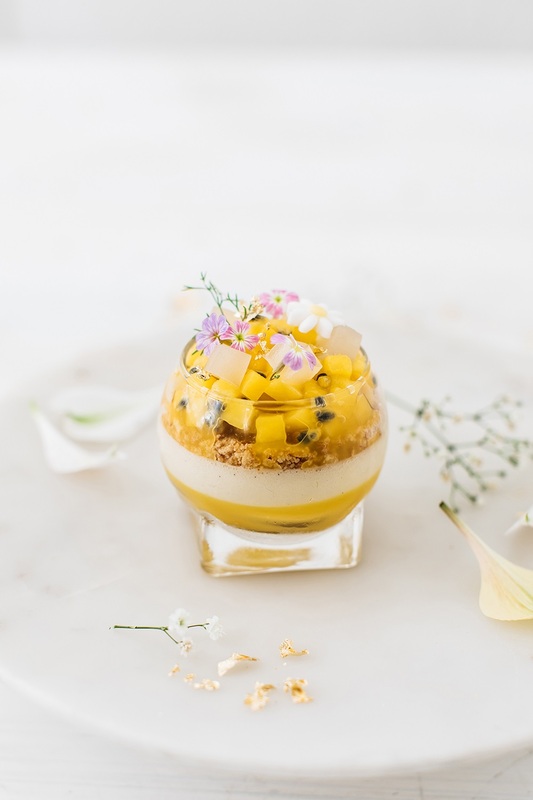 Take your diced cubed mango, passion fruit and mix with chopped mint and 10g sugar, then set aside. 1. Place digestive mix in the bottom of each jar. 2. Place layer of cheesecake mix. 3. Then a layer of your mango and passion fruit mix. 4. Then your cheesecake mix. 5. Then a thin layer of your mango and passion fruit mix again. 6. And finished with cubes of soursop gel on top. 1. In a saucepan, cover the ginger with 500ml of water and bring to a boil. 2. 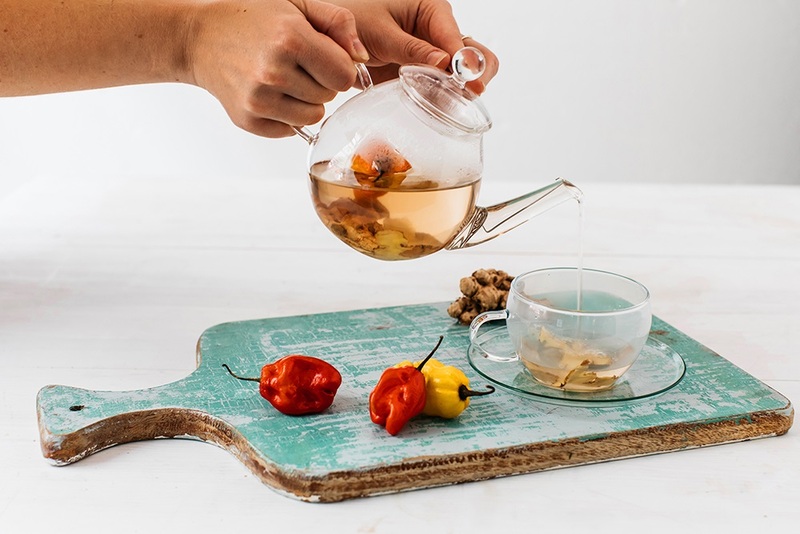 Place the scotch bonnet peppers (whole) in your teapot of choice and pour your hot water with ginger over. Let the tea brew for 5 mins, the pour. Recipes provided to me by Jason Howard and Celebrity Cruises. These all sound so tasty! Especially that passion fruit cheesecake. Yum! These are exciting recipes. Something totally different. I have to give them a try!